Galway’s focus for the league has shifted significantly since 2018, with their eyes on bigger prizes. Gearoid Armstrong competes for a ball with Paul Flynn. WHEN KEVIN WALSH was asked about his aims for the league campaign after last night’s defeat to Dublin, his response said a lot. “I suppose it’s our second year in Division 1. We definitely haven’t as much (fitness work) done as we would have done this time last year. There’s a few reasons for that: injuries, colleges and club maybe finishing a bit later. “But either way, our priority would be to try and keep guys a bit fresher than they were last year, maybe coming into the summer. Galway’s priorities have certainly shifted since last year’s league, which was their first top-flight football campaign in seven years. The Tribe’s starting team for yesterday’s 11-point loss to Dublin saw nine survivors retained from their All-Ireland semi-final defeat to the same opponents. Dublin similarly lined out with nine players who started that 1-24 to 2-12 victory last August. But there has been a deliberate shift in Walsh’s approach to the league this time around. 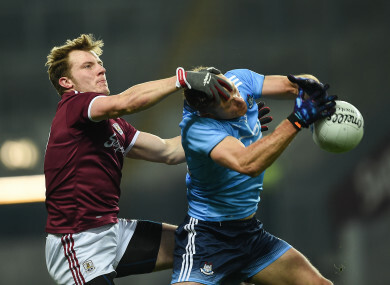 Last year, Galway went through the regulation stage unbeaten and lost by four points to Dublin in the Division 1 final. But by the time the sides met in the last four of the All-Ireland series, 11 points separated them and a Dublin victory never looked under threat. A week earlier, Galway went down meekly to Monaghan at Pearse Stadium in the Super 8s. For all the promise of Galway’s spring campaign and their subsequent run to the Connacht title, they fell flat when it really mattered in August. The Tribe boss is a financial advisor and he tends to analyse football in a similar fashion. The 2018 “end of year accounts”, as he often puts it, would have highlighted the fact that Galway need to peak later in 2019. Often times, sides who are promoted into Division 1 put in a heavy pre-season campaign in order to hit the league running. But after regaining their provincial title and reaching the last four of the championship, the priorities have shifted for Walsh’s men. Rather than proving they belong with the big boys, Galway are more comfortable in their own skin. The aim now is to maintain their Division 1 status and try blood one or two youngsters for the year ahead. In Cillian McDaid and Liam Silke, Walsh has a pair of top-class players to introduce into his team this season. It offsets the loss of the Sweeney twins, Patrick and Cathal, who opted out of the squad for 2019. Silke played in the first round against Cavan, but is now focusing on Corofin’s upcoming All-Ireland semi-final against Gaoth Dobhair. McDaid featured for 35 minutes yesterday, before his withdrawal at the interval with a foot injury. He showed enough promise in the opening period to suggest he’ll be a key figure for the county in the coming year. The Monivea-Abbey clubman, who returned from a one-year stint in the AFL, kicked two points off John Small in the first quarter, which is no mean feat. The injury list includes star names like Damien Comer, who’ll “be another little while” before he returns to the field according to his manager, and Paul Conroy. The midfielder is on the comeback trail after his horror double-leg break during last year’s Super 8s win over Kerry. Meanwhile, Corofin’s All-Star Ian Burke, Silke, Michael Farragher, Kieran Molloy, Dylan Wall and Bernard Power are all club-tied until 26 February at the earliest. Barring a disaster against the Ulster champions, they won’t be available to return before round 7 of the league. Players like Padraic Cunningham and Gearoid Armstrong gained some important big-day experience at HQ. But the nature of the 11-point loss will be a little concerning for Walsh, even if he maintained they played well for the opening 50 minutes or so. “We’ll take the learnings from this,” added Walsh. “It’s important that we look and say, ‘What did we do well and what did we do poorly?’ When the goal went in I have to say we wouldn’t be happy that maybe defeat was accepted at that time. “That’s probably our first league defeat when there’s points on offer in the last two years almost, so it’s not a bad consistency with the team. “But there’s been times before where we’ve been down six or seven points and they fought to the end. Maybe fatigue kicked in a bit, as I said we haven’t as much work done and losing Cillian McDaid at half-time was a bit loss. “We need that impetus to be breaking the line. It’s still only the second game from seven, but we’ll see what we’ll learn from it. “Not a bad first-half, not a bad first 20 minutes of the second-half. We were still well in the game at 0-9 to 0-6. We had 12 kicked turnovers in the second-half which is just unacceptable. Five in the first-half, which is just about acceptable. Allowing Dublin counter-attack by kicking away so many stupid balls is going to put you under pressure. “So I’d be very unhappy with that and also there was a stage when the goal went in, the reaction to that wouldn’t have been that pleasing. We allowed them fetch a lot of ball in the air as well without contesting properly. Email “'Our priority would be to try and keep guys a bit fresher coming into the summer'”. Feedback on “'Our priority would be to try and keep guys a bit fresher coming into the summer'”.